Guitariste et chanteur Country US né Thomas Charles Bresh, le 23 Février 1948 à Hollywood (Californie). 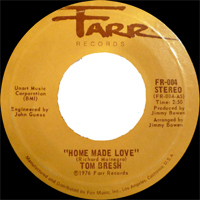 The versatile Thom Bresh played no less than nine instruments, including the tuba and the steel guitar; he also sang, acted, and did impressions of celebrities. Although involved in country music since the early '70s, with many hits, Bresh never made it to the loftiest heights of superstardom. The son of country hero Merle Travis, Bresh was born in Hollywood, where he debuted at the age three singing "Your Cheatin' Heart" at the Carriganville Movie Ranch. He made his feature film debut at age seven and was already learning to play guitar. 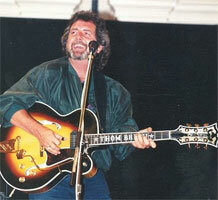 At age 15, he replaced Roy Clark in Hank Penny's band and eventually replaced Hank when he retired. Bresh then became an actor/stuntman for about ten years, also playing with the Crescents in the mid-'60s. In 1970, he formed his own road band, toured, and eventually returned to L.A., appearing in musicals such as The Music Man. He next moved to Seattle to run Merilee Rush's recording studio and co-hosted the Canadian television show Nashville Swings. He cut the single "D.B. Cooper, Where Are You" in 1972 for Kapp, recorded two singles for MGM three years later, and moved to the Farr label in 1976. There he recorded the album Homemade Love, whose title cut became a Top Ten hit and was followed by a string of Top 40 hits. 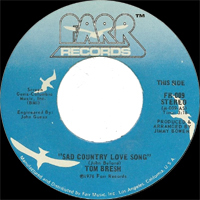 In late 1977, Bresh began a four-year association with ABC/Dot Records, where he cut two albums, Kicked Back (1977) and Portrait (1978). Bresh signed to Liberty in 1983 and released a minor hit duo with Lane Brody, "When It Comes to Love." He and Brody continued working and touring together, even starring in their own TV special. 197? SP KAPP ? (US) D. B. Cooper, Where Are You ? / ? 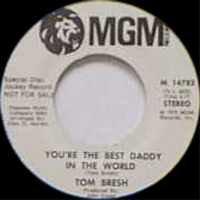 1975 SP MGM 14783 (US) Tom BRESH - You're The Best Daddy In The World / ? 1975 SP MGM 14824 (US) Tom BRESH - Soda Pop And Gumball Days / ?